Welcome to the Bath Catholic University Chaplaincy website. For all the latest news and events from Father Bill OSM, the Bath Catholic University Chaplain, keep and eye on this website and Facebook. I am Father Bill OSM, the Bath Catholic University Chaplain - I am a Servite Friar and a Catholic Priest serving the students and staff of University of Bath & Bath Spa University and across the city, and also the people of the Parish of Ss Peter & Paul in Combe Down. If you are a Fresher to Bath or a returning Bath Student and are looking for Holy Mass in your local area or for a Christian community in which to connect with, then do get in touch and say hello and meet some like-minded people. All the times of Holy Mass in the area can be found on this site and I look forward to meeting you. I am always available for chat after Holy Mass and at mutually convenient times at other events in the Ecumenical Chaplaincy Centre on Claverton Down Campus, at Bath Spa University SU on a Thursday lunch time or at Ss Peter & Paul Church in Combe Down. If any of you regardless of whether a Catholic, another religious tradition, or of no faith at all, needs a private word or just a chat by phone, just email me or give me a call. Holy Mass is celebrated for all on University of Bath Campus on Sundays in term time at 12.30pm in the Ecumenical Chaplaincy Centre will be on Sunday 28th April and all are welcome. 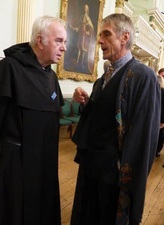 Father Bill OSM meeting the new Chancellor of Bath Spa University, Mr Jeremy Irons.